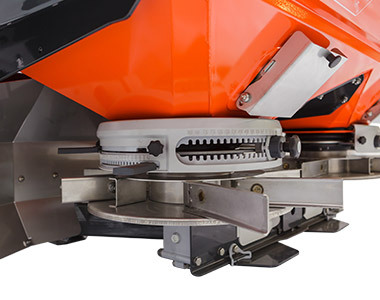 The Kubota DSM-W and DSX-W are weighing spreaders with the advantages of speed related spreading and a high frequency automatic calibration. The DSM-W has hopper volumes from 1,100 - 2,000 litres, can spread up to 28 metres and has one 10 tonne load cell. 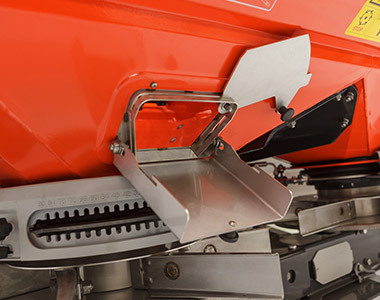 The DSX-W has more capacity with hopper volumes from 1,500 - 3,900 litres, can spread up to 54 meter and it has four 5 tonne load cells positioned on both the front and the rear side of the spreader for the most accurate weighing. With the unique reference sensor the weighing system of the DSM-W and DSX-W will correct automatically on slopes and for shocks. Therefore these spreaders can work with high accuracy on rough terrains and in hilly conditions.